Workplace safety games offer you a fun, budget-friendly, and memorable training tool to help gain employees' attention, elevate their understanding of company safety policies and procedures, and motivate them to be part of the solution in achieving and maintaining a safe work environment. No matter how big or small your workforce or the size of your training budget, there are workplace safety games options that will meet your needs. To access any of the printable games, simply click the corresponding image. The printable will open in a separate browser window in PDF format. You can add your company logo and print, as well as save the game document to your hard drive or storage device for later use. The Workplace Safety Survivor Game is a great team building exercise to reinforce previously demonstrated safety and emergency procedures that also builds team cohesion. For this game, you'll need to divide your training attendees into at least two teams. 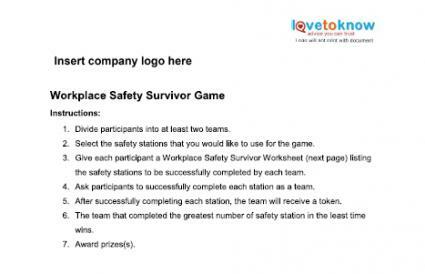 Challenge the teams to a series of workplace survival station tests, using the safety station ideas on the above printable. The team that correctly completes all survival stations first is the team that wins the game. Each team will receive a token after they successfully complete of each survival station. 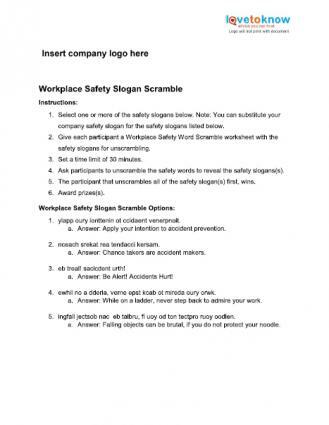 Workplace Safety Slogan Scramble offers a quick way for participants to become familiar with the idea of workplace safety themes and key characteristics of a safety focused workplace - many of which rhyme or create a visual to remember. 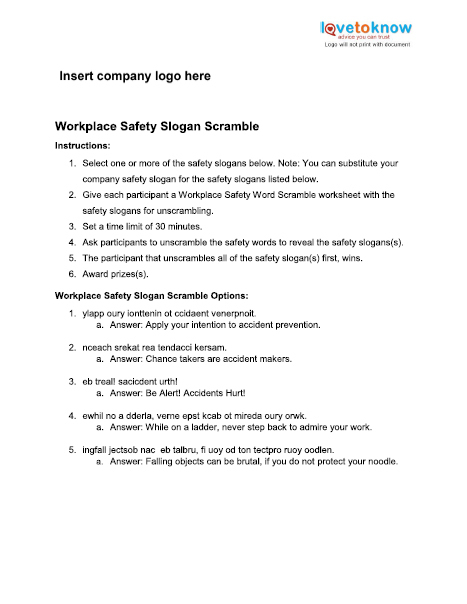 The printable below includes a worksheet listing the pre-determined safety slogans with the words scrambled. Each participants should receive a copy of the worksheet, and be given 30 minutes to unscramble the words to reveal the safety slogan(s). Participants can earn extra credit by creating their own safety slogans should time permit. Download the Safety Slogan Scramble game. Charades is a familiar and entertaining word guessing game that can be a powerful safety training tool. 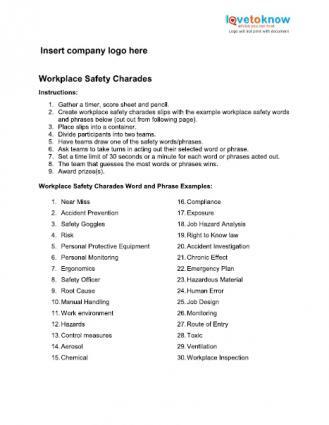 To play Workplace Safety Charades, teams must guess the safety-related words or phrases correctly before time runs out by observing the acts of one of their team members. You will need a timer, score sheet and pencil, and workplace safety topics. Suggested topics are included in the printable, along with complete instructions. Divide your participants into two teams. Have the teams take turns in acting out their assigned word or phrase. Set the time limit for 30 seconds or a minute for each word or phrase. The team with the most points wins. Download the Workplace Safety Charades game. The printable games above aren't the only options. Safety Slogan Lottery Winner and Safety Show and Tell are two more options that you may want to consider. While it is not quite Mega Millions, this safety slogan lottery will certainly pique great interest at minimal cost. Place all employee names in a hat or bag. Every day or every week (depending on the size of the workforce and budget), the manager posts a safety slogan to all company bulletin boards. At any point during the day, the manager approaches the employee whose name has been drawn and asks the employee to quote the safety slogan of the day. If the employee can quote the safety slogan, the employee receives a lottery ticket. If not, the manager adds the lottery ticket to the award the following day or week, increasing the award value. When an employee is able to quote the safety slogan accurately, that employee receives the entire award. The next day or week the contest starts again with a new lottery ticket. There's nothing like show and tell to keep the training interactive and fun for your staff. To kick off Safety Show and Tell, invite two or three of your local government agencies such as law enforcement, the fire department, emergency management, risk management, or poison control into your office to demonstrate relevant safety-related topics. Ask the guest speakers to present on specific topics or ask them to make a few recommendations and you can select the topic that best fits your needs. Divide your group into at least two teams. Set a 25 minute time limit. Instruct each team to elect a team leader to report their findings at the end of the game. The team that offers the most examples of how to prevent workplace accidents wins. Give bonus points to teams that offer practical, outside-of-the-box creativity or cost cutting measures. When deciding what safety games to use, it is important to consider the organization's culture and to select games that are likely to be a good fit for the audience. What is the nature of the company's operations? How many work locations are there? Do the participants include line staff, executive staff, or a mix? Do the participants regularly work together? Is this the participants' first safety training or could they almost teach the class? What is the typical education level of the participants? What are the typical safety hazards that the participants will encounter such as office tripping hazards or heavy equipment hazards? What will be the duration of the safety game? What is your budget for the safety games? Employers feel mounting pressure from their employees, unions, and society in general to keep a safe work environment. Employers have a strong interest in avoiding negligence lawsuits from employees as well as public shaming and fines from regulatory agencies, such as the United States Occupational Safety and Health Administration (OSHA) due to workplace safety violations. As a result, many employers are implementing safety as a core value through safety policies and training initiatives. These programs often include games, which can be both motivating and meaningful. These fun and easy workplace safety games give you the tools and the opportunity that you need to start or expand your workplace safety campaign, curb workplace accidents, reduce employer work related injury expenses, and keep your workforce healthy. Continuing to encourage your employees to embrace safety as a way of doing business is just a game away.